It has been a very full Day #1 here at Tent of Nations! First: how I got here, literally, in contrast to my previous journal entry that described how I found myself volunteering at ToN and being a part of its 100th anniversary party. Last evening I came by taxi from Bethlehem with two other fellow participants and volunteers. Hans and Tika are a Dutch father and son team. Last year Hans brought his 15-year-old daughter. Tika, at age 13, is the youngest member of our international contingent of approximately 70 people and a friendly, engaged teen. It was a good thing that one of us had been here previously. 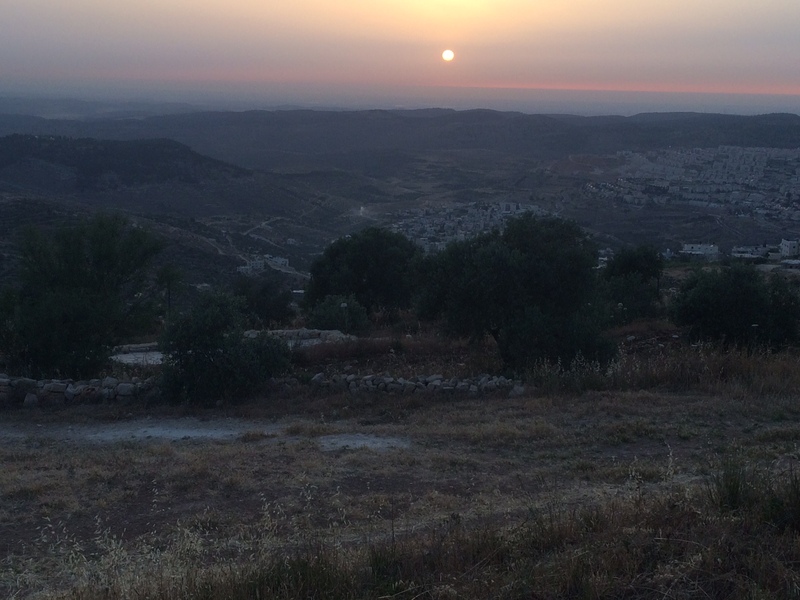 The taxi driver could only take us most of the way from Bethlehem to the Nassar property. This is because the road from the highway to their gate is blocked by the Israelis and has been since 2002. Huge boulders have been placed across the narrow road in several places, so that no car can pass. It signified squarely to me that this is Area C of the West Bank, wholly controlled by Israel, even though illegally occupied according to international law. The West Bank has been strategically carved up by the occupiers, with checkpoints, road blocks, and separate roads that go either directly to illegal Jewish settlements from Israel or are for Palestinians to use in prescribed ways. Hans, Tika and I carried and dragged our bags up the road about 200 ft., along a valley. We looked across to terraced hillsides and… massive settlement complexes perched on the hilltops. These are not small housing developments; the biggest has over 40,000 occupants. The scene is both a lovely rural scene and a seriously scarred landscape. The gate was locked, so Hans called Benjamin, one of the volunteers who was in residence. He came to unlock the gate and bring us in. He showed us to our tents– 3 big green canvas dorms set beside each other behind a row of trees with benches between them. I got a bed in the women’s tent, at the end of a row of 8. The tents are luxurious, for tents. Stone floors, electricity, and single beds with mattresses and pillows. In the evening I had a look around the farm, which has all sorts of interesting spaces and areas, and uses many sustainable low-impact living technologies and strategies, including solar panels for electric lighting, composting toilets, cisterns for rainwater, outdoor solar showers, and caves in addition to the tents. (Yes, caves for meetings and many other uses.) As the leader of ToN, Daood Nassar says, the Israelis will not allow them to access water, electricity, or building structures. So, they found other ways that are more environmentally responsible anyhow. 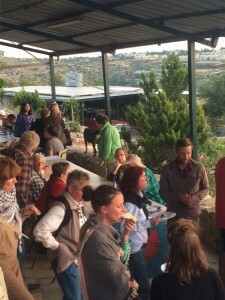 The 30 or so volunteers who had arrived over the last week had dinner outside under the covered terrace, looking out over the valley to witness a beautiful sunset. The we gathered around a campfire with members of the Nassar family, getting to know one another, telling stories, and hearing some ukelele playing. I slept deeply, tucked into my sleeping bag in the big green tent. Today started with breakfast for the volunteers out on the terrace at 7:30. Soon afterwards our numbers were about tripled by a group who is staying at the Bethlehem Hotel and will come out by bus each day this week for work parties, discussion groups, workshops, and meals. We made an official start to the 100 Years Celebration with a gathering of the 60-70 international participants from China, Germany, Ireland, the Netherlands, Norway, Scotland, and Sweden. The Dutch are by far the largest group. And we range in age mostly from our early 20’s to early 80’s. There are many individuals representing faith-based groups, and an abundance of Protestant pastors. Many who have been here before and a lot of us here for the first time. For some, it is their first trip to Palestine or Israel. 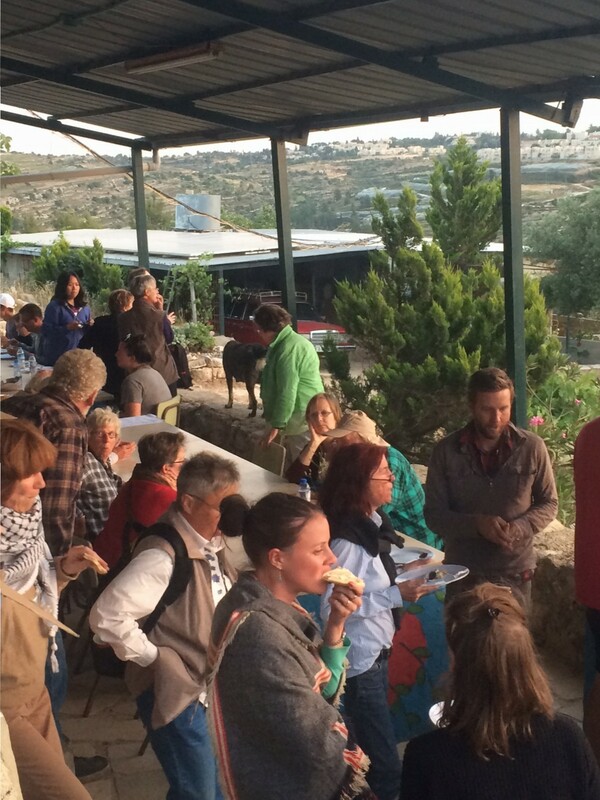 All of are here to support the Nassar family in their ongoing struggle to stay on their land, owned since 1916 and, since 1991, under threat of confiscation and demolition by the Israeli government. The Nassar’s choose to not resort to violence; they reject victimhood and despair; and will not leave Palestine. They instead refuse to be enemies and opt for creative nonviolent resistance. The support of an international community of supporters inspires them, as we are in turn inspired by their reliance and commitment.